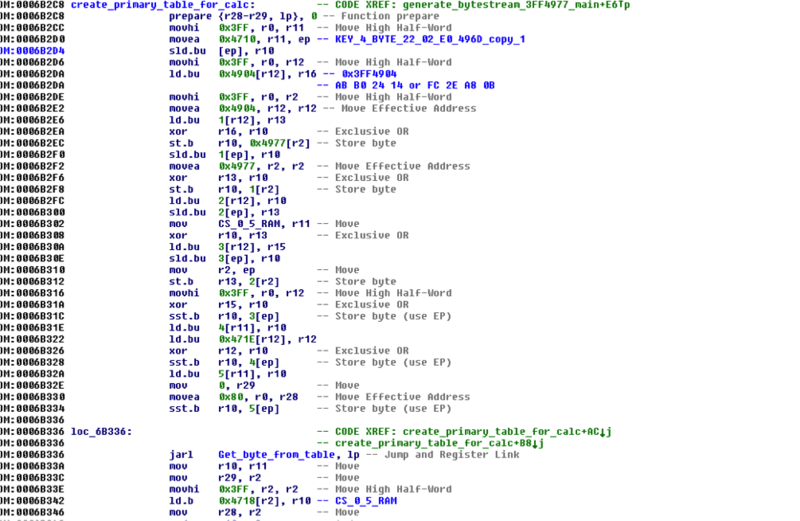 Reverse Engineering VW online key programming function for Fun And Profit. VW has an online service called GEKO which allows you to program keys to a vehicle. The thing is, what if you don't have internet access or cannot come to the dealer ? This is a walk-through of how I disassembled the control unit firmware to identify the routines and procedure to perform this function of key programming offline. A log makes understanding a lot easier. In the logs I identified some significant byte changes. They are marked in RED. But how to determine what is done here? The changes seem like random junk, so the way to get some structure and understanding lets get a flashdump of a dashboard. There are several ways to obtain this. We covered this in our training sessions and will soon do some articles on this method of obtaining vehicle control unit flash dumps. Let me breakdown the log file a little for the sake of completeness. The very first step after loading the dashboard firmware into IDA is to look for the command-handlers. From the log, I understand that I need to get the answer of the 22 02 E0 command and the processing of the 2E 02 E1 command. So in hexeditor i looked for 22000000 and 2E000000 (at least in this example) and made a struct in IDA with the address found. After establishing where the 0x22 and the 0x2E commands are handled. Lets start to track down firstly the 0x22 command. 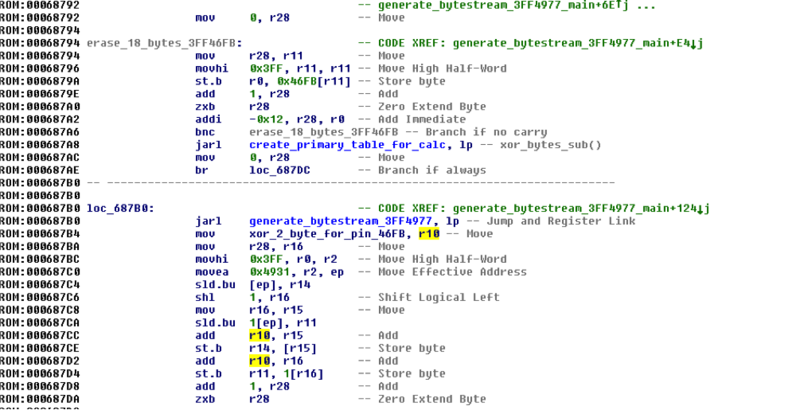 After some tracing in the disassembler there is a switch for the different subcommands. I look for the 02 E0 and it’s find it first in the table. Now we look at the 2E 02 E1. There is no table or switch this time for the subcommands, just a hardcoded compare and jump. After some more tracing I find some interesting function that XORS the immo-Pin with some calculated value and compares it with the first two bytes of the 2E 02 E1 command. The address I marked with xor_2_byte_for_pin is where I should start investigating. 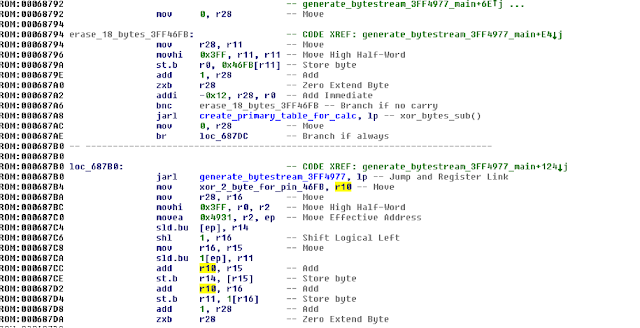 The RAM address points to several functions, but most of them just read some data from the xor_2_byte_for_pin address. I need the function that WRITES data to the xor_2_byte_for_pin address. This function found, is where the xor_2_byte_for_pin address builds some table with data generated from the two main functions and then stores it to our location. The first function is this and it takes some fixed values from flash, 6 bytes of the CS (a random number used in VAG Immo systems) and the answer of the 22 02 E0 command. Bingo !!!! So after converting all this stuff to some more readable C-code I can try the calc. Compared with the log we received, it fits perfect. If you interested in learning about automotive control unit disassembly let us know, we setting up a list of interested people. - Confirming the calculation looking at OEM or other tools which support this function logs.